This issue of Alliance looks at the emerging generation of donors around the world. There are many stereotypes of the ‘new’ donor – hands-on, impact-oriented, high-tech entrepreneurs, looking to apply the skills that contributed to their business success to their philanthropy. Matthew Bishop, writing in a special philanthropy supplement in The Economist in February 2006, coined the term ‘philanthrocapitalism’ to describe this set of characteristics. How well does it fit the world’s new donors? Guest editors are Olga Alexeeva and Matthew Bishop. This special feature includes interviews with Vladimir Potanin and Rohini Nilekani and snapshots of new philanthropy around the world; feedback from a group of donors on a field trip to Ghana; and a round-up of the emerging philanthropic intermediaries. While Olga Alexeeva has some reservations about the philanthrocapitalist approach, especially about its reluctance to work with existing NGOs, Matthew Bishop stresses the great benefits to be reaped – provided constraints like the difficulty of measuring impact and ambivalence about transparency can be overcome. 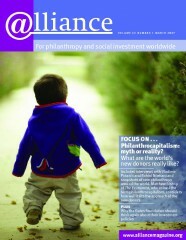 This issue of Alliance also includes articles on funding for women’s rights: the work of the Charity Commission’s International Programme on NGO regulation in other countries; and the unintended consequences of international philanthropy – plus Stephen Pittam of Joseph Rowntree Charitable Trust making the case for ethical investment. This is the first issue of Alliance to be published by the newly established Alliance Publishing Trust (APT). From 1 January 2007, Alliance is published by APT in association with the Network of European Foundations and the European Foundation Centre. New philanthropists in India – Returning to their roots? From Queretaro to Accra – Why are women’s rights losing out? Individual corporate foundations no longer needed? Altruism – it’s a brain thing! ‘Positive’ feminism just too cosy?